Digital living-space listing company Apartments.com is launching a campaign supporting a sweepstakes offering free rent for life (of the renter, not the apartment). The alternative offer is also pretty good: free rent for a year. To tout the program, Jeff Goldblum reprises his role as fictive Silicon Valley-ite Brad Bellflower, the Steve Jobs of renting. The company, acquired by CoStar last year for $585 million, says the “Rent for Life Sweepstakes” gives apartment dwellers the chance to get their rent covered by submitting a review of their current apartment to Apartments.com. During the campaign, which runs from until Oct. 12, the company will randomly select one reviewer per week to win free rent for a year for a total of 12 winners. At the conclusion of the sweepstakes, Apartments.com will randomly select and announce one winner to receive free rent for life. The effort, via Santa Monica, Calif.-based RPA, is supported by two national TV to air on network prime and cable as well as Hulu and NBC's full episode player. The company will also do a home-page takeover of Wired.com and a roadblock on CNN.com July 23. Digital will extend to display, pre-roll and rich media as well as on social platforms. Local market radio is also planned, per the company. 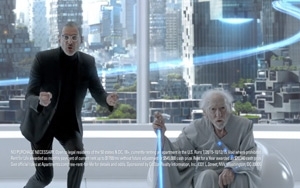 One of the TV spots shows an elderly man in a futuristic apartment overlooking a city of tomorrow. He is extolling the virtues of the "Rent for Life" sweeps, saying that since science invented ways for people to live a lot longer, he's been enjoying free rent for a long, long time. Goldblum shows up, asks him, wryly, if he likes his apartment, and comments on the great view. The company says support will come from a social media play driving submissions for the sweepstakes. It will feature announcement posts on Facebook and Twitter, and weekly winner recognition posts for each winner. The company says it will also re-Tweet (and its analog on other social channels) fan reaction. The launch campaign with Goldblum touted a new search tool called Polygon, where users can virtually draw a shape on a map to outline search areas. It also lets you make commute time a variable.